In a large pot on medium high heat add pumpkin, potato, carrot and onion. Cook for 4-5 minutes or onion begins to turn translucent. Sprinkle in cardamom, stir and cook for 1 minute. Pour in broth. Season with salt and pepper. Bring to a boil. Turn down heat and simmer for 10-15 minutes or the pumpkin can be easily pierced with a sharp knife. 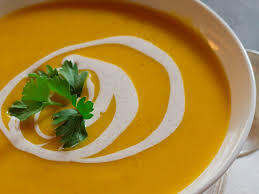 Puree with a hand blender or let cool slightly and puree in blender in 2 batches. Stir in 1 tablespoon of vinegar and taste. Add the second if necessary. The soup can be served hot or chilled.